What would your proposal for freight be? The Cross Harbor Tunnel is basically pushed by a single person, you probably don’t want to waste valuable Manhattan rail capacity on freight, and rail on the Tappan Zee was abandoned. Not to mention that the BQE itself serves as a link to industrial areas. 2. Surface streets, it’s not that many trucks. 3. Maybe don’t pollute the city to hold on to waterfront manufacturing on the wrong side of the harbor just so that some politician can play to a national mythology of industrial jobs. You have to raise the overpasses on the Belt to accommodate trucks, not a major problem in theory, but with NYC incompetence and corruption that would probably cost north of a billion and take 3-4 years. Bring in that crew from the Netherlands who replaced the highway tunnel in three days and we’d be ready to shut down the BQE by summer time! Not everything in Maspeth is industrial production. A lot of it is warehousing and the freight yards and such for distribution of goods in an island with 7.5M people on it. Assuming it has clearances. The Belt Parkway is a Parkway. Most of the day in the literal sense, that you can get out and walk faster. I think he’s forgetting about the Gowanus Expressway, the Belt ends in Sunset Park and the Gowanus connects the Verrazano Bridge with the BQE. That is all I-278 is a hint. Makes me wonder what those 14,000 trucks a day are carrying. Probably stuff like food and toilet paper. Bidets all around and have Amazon drones deliver food from distribution centers in New Jersey? I wonder how big they would have to be to deliver half kegs of beer to bars. …. All the way out to Greenport and Montauk. Getting rid of the BQE is Free Money. While I would love seeing the BQE disappear completely, I highly doubt that this would happen. This is the US and the car is the king in the outer boroughs. I am not familiar with all proposals on the BQE. Has anyone proposed open cut excavation for a tunnel? While it will be expensive, no doubt, it will be much cheaper than boring the tunnel and also will allow for buildings, parks and whatever else to be put on top in pretty much the way you are proposing. Open cut excavation cannot be any more disruptive or noise generating than the currently proposed aboveground replacements, but does result in elimination of the thing from the surface and opening up the area to development. Also open cut excavation allows for the tunnel to be relatively shallow which is good for egress, ventilation and overall cost. Vibration will be worse than a deep bored tunnel, but cannot be any worse than with above surface replacement. Also shallow is good for easier protection of the thing from raising ocean levels and climate change. I don’t even think open-cut excavation is feasible along that alignment? It’s feasible if you remove the highway first, but otherwise, there’s still no right-of-way for it in Brooklyn Heights or in DUMBO. This isn’t a subway, where you can make do with 10-12 meters of street width – freeways have wide footprints. And as for “car is king,” this is New York, a city where the majority of households are car-free. >> freeways have wide footprints. Typically yes, but the only reasonable suggestion so far (other than demolition) is the one by the comptroller, which is to build a two lane highway (one lane each direction) to be used only by trucks. If this could be built using trenches, it seems like a very reasonable suggestion. Of course the other option is to just destroy it, and aggressively deal with the surface streets by adding congestion taxes or restrictions in general on cars. I have no idea what it would like, or if the idea has been studied. It is easy to see how bus lanes can help quite a bit, but what about truck lanes, or even the combination? One of the proposals is essentially capping a surface-level highway where the cantilever currently is. So you would replace Furman St with a highway, put a cap on it with a local street and a park, and then maintain the promenade or build some kind of terrace connection to Brooklyn Heights. So it should be less expensive than the Big Dig since it involves very little actual tunneling. What’s your opinion on the A100 in Berlin? Most of it follows the Ringbahn, so the neighborhood-splitting issue isn’t really valid. That said, if Berlin wants to build more housing where people want to live, then the Westkreuz area could make nice TOD (although to be honest the most desirable part of Charlottenburg is closer in) if the Autobahn goes away. But it doesn’t look like the gash that the BQE is, or the the waterfront blocker that the Voie Georges Pompidou and the Embarcadero Freeway were. Where would an extension of U4 even go? Is there really the demand for a connection to S1? Comparing the RPA’s suggestion for a four-lane BQE to lynchings and torture is far out of line. Firstly, there is absolutely no moral equivalence between transportation policy debate and murder as a public spectacle or torture. Second, there is nothing evil about proposing different policies that stem from different assumptions or goals. You yourself have advocated keeping the Providence Line south to Attleboro two tracks with overtakes instead of three tracking the entire length. How would you feel if someone compared your plan to vaccinating only two-thirds of the population against smallpox in the 1950’s and leaving the rest to die? You may agree or disagree with the RPA’s plan, and you may or may not be right about the better plan for the BQE, but you can argue via facts, reason, and appeal. There is no need to resort to inflammatory false equivalences or default ad hominem attacks. Note that I have no objection to criticism of the RPA or other organizations for organizational traits (institutionalism, timidness, etc.) related to the type of policies they do or don’t support. I would respond by noting that timed overtakes have higher capacity than a third track and talk about the need to integrate schedules with infrastructure. What I’m proposing is a way to get more capacity at lower cost. This is not the same as saying that freeways are bad and pointing out great examples of freeway removal and then recommending spending billions on rebuilding a freeway at slightly less capacity, with all the problems that construction would cause (which the RPA agrees are problems!). I see your point, but I respond by noting that the examples you choose are needlessly inflammatory compared to the subject at hand. There is a massive moral and ethical implication in suggesting someone wants to only reduce some lynchings vs stopping them entirely. I would be more receptive to your argument if you had said “This is like the RPA proposing Second Avenue Subway Phase 1 with stops at only 86th and 96th” or “This is like the RPA proposing off board payment everywhere but bus stops south of 14th St” (both in the the context half measures when implementing a good idea). Your comment regarding timed overtakes just proves my point: there are good financial and technical arguments for timed overtakes vs three tracks, just as there are arguments for (and against) various BQE options (6 lanes, 4 lanes, removal). The appropriate path is to engage the arguments, not make simplistic and specious comparisons to acts of evil (2/3 tracks = 2/3 vaccination, 25% reduction in lanes = 25% reduction in lynchings). 4 lanes isn’t some clever way to increase capacity at lower cost than 6 lanes. It’s less capacity for marginally less money (since the structure needs to be replaced either way if it’s not removed). I don’t want to analogize this to partial off-board fare collection, because the lynching analogy is frankly better for a Northern organization, in the sense that there’s widespread understanding that there’s a problem there and that it should be fixed with all deliberate speed. In the specific context of a proposed rebuild, rebuilding the same thing but narrower just screams “we’re negotiating with ourselves” in ways that (say) a partial road diet elsewhere does not. It’s this desperate attempt to appeal to everyone at once even when the middle path is truly nonsensical; I’d understand an outfit that proposed an 8-lane rebuild better than one that’s proposing a 4-lane rebuild like the RPA is. We need a good transportation mix and eliminating highways where alternative do not exist is not a good idea. But alternatives do exist. There’s a subway, which includes the G train roughly parallel to the BQE as well as express trains through Manhattan that don’t get stuck in city traffic. Every NIMBY argument against closing the highway can equally be lobbed at tolling: it would incentivize drivers to use surface streets, it would make it harder to drive, etc. Ultimately it’s a question of whether you value clean air and safe streets or motorist convenience. Tolling is just part of the way toward elimination of the road, and given the high cost of replacement, it gets into the 20%-of-the-benefit-for-80%-of-the-cost problem. Where are the trucks going to go? The G train doesn’t go to Hunts Point Markets. Or distribution centers in New Jersey and Pennsylvania. Surface streets, or nowhere (they’re 9% of expressway traffic). And Hunts Point is way better served by the Bronx expressway network anyway. You do understand how distribution centers work don’t you? Truckloads or railcars of stuff come in from long distances, lots of people shuffle stuff around and then mixed loads of stuff go back out to local destinations. The Bronx expressways don’t go to supermarkets in Brooklyn. I suppose Amazon can train the drone to hover outside your bathroom window with a six pack of toilet paper. And carry a bag of garbage back out. The Manhattan and Williamsburg are the only direct entrances to lower Manhattan for full size trucks, including everything from the port. You know you don’t have to tolerate the same incoherent infant ruining the comments section of every posting. 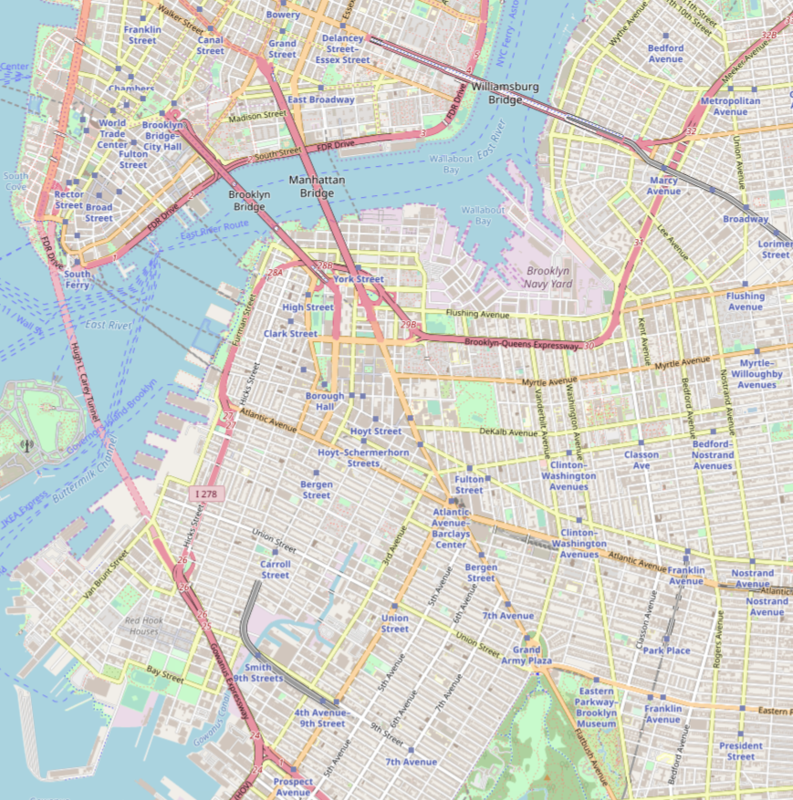 The G train gets one from brooklyn to queens but does not allow someone from Queens to access the rest of the united states – yes subways are great for intra-city transportation. Highways are needed for much the non-intra-city transportation. Thus we need both. No! it is a question of how to strike a balance. A large part of the creation of the US constitution and the federal government was about interstate commerce and the ability to get from one city/region to another. What you call motorist convenience is really a lack of appreciation the need to be able to travel beyond NY. Per the comptrollers report (linked above): Over 80% of the traffic is for intra-New York travel. So you are saying we should spend billions of dollars so that a tiny minority of drivers can get out of town more quickly? It’s been necessary for over 100 years. Should have been built when the Port Authority was first told to build it over 100 years ago. The Stern Report is an outlier https://en.wikipedia.org/wiki/Stern_Review and generally estimates the costs of unmitigated climate change at 10%, with a possibility of up to 20%. It uses a discount rate of approximately 1.5%, which is very low. You could invest the money saved from not having such a high carbon tax and invest it at much more than that. And the Stern Review estimated SCC is currently $200 https://www.pnas.org/content/114/7/1518 not $500. A freeway has much lower accident rates than surface streets, and most of that is covered by insurance that drivers pay. Trucks emit more in stop and go traffic than on a free moving freeway. And the costs of the traffic can be recovered by tolls. It estimates the cost at 20% over the long term including an adjustment for the fact that most of the costs are born by low-wage countries (by the usual one-dollar-one-vote method it’s 10%, yes); you can project it back to 20% today if you use a discount rate equal to long-term global economic growth. And a freeway is a net increase in accidents because it induces more traffic, which is why American accident deaths skyrocketed in the years the Interstates were built. The difference in fuel consumption between city and highway driving exists but is a lot less than the effect of disappearing traffic. Then just give lower income countries money. Instead of spending $2 to reduce $1 of climate change damage in low income countries, give $1 directly to those countries. …Lagos is in a coastal floodplain. And I’m not playing third-world Paretianism; the world’s poorest countries overall are net importers of oil and emit very little GHG for their own consumption even relative to how poor they are. Wake me up when companies deploy this in Sweden, where the carbon tax is 120 euros per t-CO2. I can’t find specific information but I doubt the Swedish government pays that rate for carbon capture as much of its industry is in the EU ETS scheme with prices at 20 euros a ton. The industry carbon tax is converging to the general one, though. Why keep the BQE open past the Williamsburg bridge? I read the comptroller’s report, and I think he made a strong argument. To begin with, he didn’t say that all of the destroyed freeways lacked trucks, only that many of them did. He also spent much of the time suggesting that simply removing it is a reasonable proposal, supported by plenty of people who know what they are talking about. He isn’t the least bit worried about car traffic, but made the argument that a new facility is necessary for truck travel. Fair enough. To me, this should be the starting point. Is it necessary for truck travel? If it is, then is this the best way to move trucks through the city? Maybe, in both cases, the answer is yes. But if there are better ways to improve truck travel — or the trucks will be just fine with no freeway or other improvements — then it makes sense to tear it down. I think it makes way more sense to assume it is gone, and then try to figure out how best to improve truck travel (or determine whether it really is an issue). Too often I have seen agencies assume that the best way to solve a problem is to build something similar to what existed before, even if building that is extremely expensive. Then you end up with something like the SR 99 tunnel in Seattle, which was a big mistake. you cant possibly live here . These proposals are crazed! ALL local streets(hicks terrace, henry) will have to be sealed off after dark from the watchtower to red hook. with . restricted pass access for deliveries and with a delivery terminal constructed in the park by the courthouse. This area cant take the traffic. It is a RESIDENTIal AREA. so……………. it will be replaced! Alon! Not a fair representation of the Comptroller’s plan. And we don’t want a “narrower” highway. We want to only rebuild the bottom cantilever for trucks and use the substantial savings to pedestrianize the middle level, extend the linear park all the way to red hook, and invest in local transit — higher frequency service on the G, R, 7, and a dozen bus routes.